We had a great time - got a chance to see the new Spring Summer Catalog and some of the new products! Ordering from the New Catalog starts on January 19th - you'll be able to access the catty from my website that day - the hard copies of the catalogs should be arriving this week. If you'd like to reserve one for $5.00 plus the actual cost of shipping - you can drop me an email me. Club Members will be receive their copies FREE! More information on my Club can be found here. We made some projects - which I'll post when I get a chance. Got some really great swap cards from our demo friends in the SSUS Group - Thanks Ladies! And met some new friends! The BIG News! Later this year Stampin' Up! will be coming out with a new product called My Digital Studio! What exactly is this you ask? It's Digital Scrapbooking Software - and it's awesome! The card shown here is using the new Game Night Set, Jackpot DSP and the Warhol Technique - this is one of the things I made for the SSUS Swap Group. Cool Beans, Lisa!! 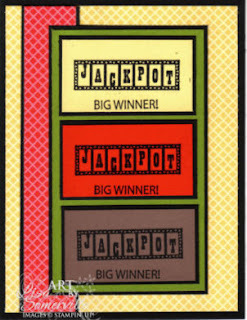 This card would be perfect for my slot machine loving mother! Glad that you are back! Welcome back! Glad you had a good time. I can't wait to see the new catty!!!! I hope that you had as much fun in Orlando as I did! I'm so sorry that I didn't get a chance to talk to you there....can't believe you were right behind me in the one class, I sneaked in late and couldn't talk during the presentation. Well, figured that I had better not talk is more like it, I am not known for being quiet! But when the class was over and I got my act together, you had already scooted off to the next session. so, sorry that we didn't get a chance for more than a quickie wave and hi but it was stil good to put a face with the name. Maybe next year? I will definitely be eager to go to Phoenix...and most likely will be in SLC for convention as well.